Claimer.org: Standing, standing, standing: the debate on climate change litigation in the U.S. Standing, standing, standing: the debate on climate change litigation in the U.S. The discussion on climate change litigation in the U.S. is still focusing on questions of standing, or demonstrate adequate connection to the damage claim. The article “Standing for Private Parties in Global Warming Cases: Traceable Standing Causation Does Not Require Proximate Causation” by Bradford C. Mank of the University of Cincinnati of September 2012, published in the Michigan State Law Review, Vol. 2012, No. 4, 2012 gives a good consolidated overview of the discussion so far held in the U.S. In a post on the climatelawyers.com blog, J. Wylie Donald asks the question: Is a filing mass law suit the right strategy to get carbon dioxide regulation going? The post refers to two recent victories of Our Children's Trust, an environmental organization based in Oregon. After several defeats the organization succeeded in using the so-called public trust doctrine for air and thereby reached standing for the individual claimants. The author assumes that these cases will undoubtedly serve as a rallying point for the remaining cases as well as to-be-filed cases. The author compares the case of Our Children's trust with a multiple legal action for law school placements. He analyses the psychological games played with mass filing of claims, not least to reach press coverage. But he points to the local conditions for successful claiming, given by the law of the states. This limits mass filing of claims. He concludes: “Like politics, all law is local.” At the end, it is not the press coverage which counts but “the particular law of the particular jurisdiction on the particular facts of the case”. The Our children's Trust recent successes and the role of particular (state) law are also touched upon in a post on one of the many sites of lawyers getting interested in the business of climate change litigation: “Texas Trial Court Recognizes Potential Application of ‘Public Trust’ Doctrine to Redress Climate Change”. The lawyers provide more insight into the “public trust doctrine” which “is a legal principle derived from English Common Law”, “traditionally applied to water resources”. The lawyers remind that courts have mostly rejected to apply this theory, via assuming an “atmospheric trust”, in the context of climate change, and this namely in “Colorado, Oregon, Arizona, Washington, Arkansas, and Minnesota”. After referring the usual AEP issues, the lawyers analyze more precisely the “troubling statements” of one of the Texas judges who was not only applying common law, but who also referred to the Texas Clean Air Act and the “Texas Constitution, which (1) protects “the conservation and development of all the resources of the State,” (2) declares conservation of those resources “public rights and duties,” and (3) directs the Legislature to pass appropriate laws to protect these resources”. 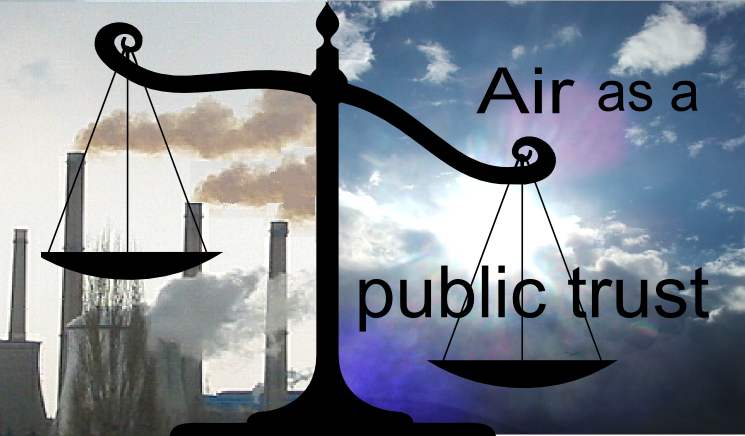 Hari M. Osofsky analyses in “Litigation's Role in the Path of U.S. Federal Climate Change Regulation: Implications of AEP v. Connecticut”, 46 Val. U. L. Rev. 447 (2012), the implications of the famous AEP decision. He concludes at the end of the descriptive part of his article that the Supreme “Court presents a vision of its future role as an arbiter of regulatory disputes, rather than as a forum for debating climate change science or for directly addressing harms to the victims of climate change outside of a legislative framework.” But much remains unclear due to this role assignment. The author doubts that the regulatory path to which the court refers will really be able to settle the fundamental issues of justice posed by climate change; at least with regard to the question of compensation for damages. On this blog like on some others, we wonder how tort law can be applied on climate change litigation cases, as a means to reach justice for the victims of climate change. But imagine for a second that you are a classic tort lawyer, familiar with the stability of tort law over centuries, and here comes a wave of big-scale lawsuits possibly changing the well-established, slowly evolving doctrine of tort law. The perspective is opposite, and this opposite perspective might enrich your view on how tort law can be used for climate change victims. If interested in that perspective, here is the right article for you: “What Climate Change Can Do About Tort Law” by Douglas A. Kysar found at: http://www.eli.org/pdf/kysararticle.pdf. Though being skeptical as to chances for plaintiffs, the author considers that “climate change will enter prominently into tort law’s evolutionary dynamics”. Maybe we have already found an example for Professor Kysar's theory, see our previous post: “Outstanding: a model on fairness based apportionment of liability for climate change”.